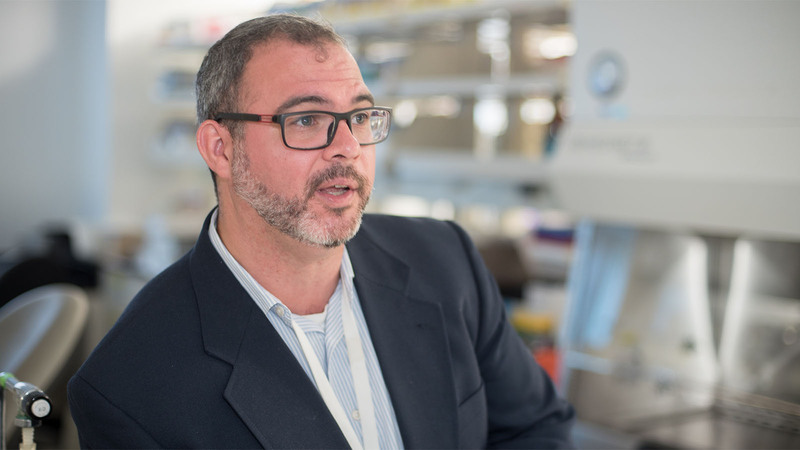 Jeffrey Willey, PhD, researches radiation-induced musculoskeletal injury associated with space flight and cancer treatment, developing novel approaches for bone loss and fracture prevention. He pursues partnerships with industry to further translational radiation research through developing cancer-treatment specific animal models and testing novel therapeutic compounds and preventative measures aimed at improving long-term musculoskeletal health. Jeffrey Willey, PhD, earned a master’s degree in biological sciences from Ohio University and a doctoral degree in bioengineering from Clemson University. His interest in improving human health during space flight began at Clemson and continued as a postdoctoral fellow at the National Space Biomedical Research Institute, where he studied radiation effects on bone tissue and cells in reduced gravity. He completed a second postdoctoral fellowship in translational radiation oncology at Wake Forest School of Medicine, studying radiation-induced cartilage and joint damage in cancer survivors. In 2012, Willey joined the Department of Radiation Oncology at Wake Forest School of Medicine to further research radiation-induced space flight effects and methods to improve outcomes in cancer patients. Through his study of space exploration and clinical radiation-induced bone loss, Willey researches the cause and extent of musculoskeletal health, including bone loss, muscle fibrosis, muscle wasting, fracture and arthritis. He has longstanding experience partnering with NASA, recently serving as principal investigator on a Space Biology Program study to assess the extent of knee and hip joint degradation of mice aboard the International Space Station for 30 days. The study also analyzes the impact of aerobic and resistance exercise countermeasures on mitigating joint damage and complications. His interest in skeletal health translates clinically, through exploration of the implications of radiotherapy on cancer survivors, with a specific focus on women treated for pelvic malignancies. He developed a clinical cortical thickness and radiation dose mapping method to monitor bone loss in cancer patients over time, with the goal of identifying patients at risk for fracture and reducing fracture rates. He also serves as co-investigator on a study examining the protective effects of a muscadine grape extract on musculoskeletal damage in a mouse model of simulated cancer therapy. Optimizing health for astronauts and cancer survivors through translational radiation research is the focus of Willey’s industry partnerships. He has specialized expertise developing cancer-treatment specific animal models and testing novel therapeutic compounds and preventative measures aimed at improving long-term musculoskeletal health.